Buying a jacket can sometimes be an arduous process. You will need to find the right jacket type, and after you are done finding the one that will work best, then there’s the design to focus on, and the style, and the colors and by the end of it you have already spent more time than necessary. When it comes to different types of jackets, there is plenty of information online on how to be able to tell jackets apart and what to look for when deciding on which jacket type would work best for you. From down jackets to lightweight rain ones, the styles and types are numerous and knowing the basic differences between each of them is necessary for making the best purchasing decision. 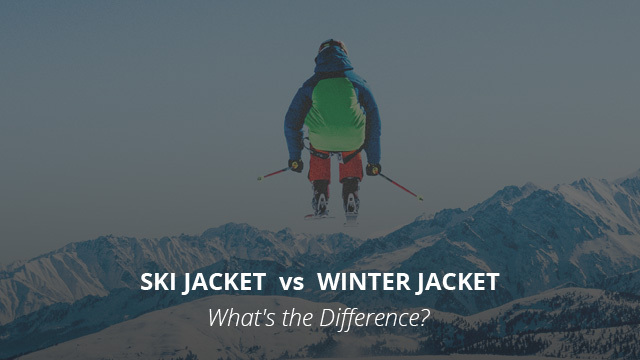 In previous articles of ours we have looked at differences between numerous jackets and brands, and today it’s time to look at Ski jackets versus Winter jackets, to better understand how they differ from each other. As you can see, today’s piece is long because we want to fully explain what the difference between a ski and a winter jacket is, but, to give you a quick and general idea, the main difference between the two is their purpose. That is, a ski jacket, as the name indicates, is a jacket suitable for skiing, whereas a winter jacket, which includes different types of jackets within itself, is a jacket made for insulation and protecting against the cold. With that out of the way, let’s take a more detailed look. Ski jackets are jackets designed for skiing, and sometimes worn for snowboarding as well. While that is not a problem if you are a casual skier or snowboarder, we would suggest you wear the proper attire for either sport. Are there differences between a skiing and snowboarding jacket? There sure are and you can find out more about that here. Now, coming back to ski jackets, we have to consider the sport they are made for and, by doing so, we can better understand the design and functionality of these jackets. Skiing is a sport that focuses on speed and agility, and as such it requires clothing that will allow the wearer to move fast and easily. At the same time, since it is a snow sport, a ski jacket must provide some level of insulation, while also being very breathable and weather-resistant. The cut is also an important factor as these jackets are made to fit snug, in order to maximize performance by being aerodynamic. This same quality is evident in ski pants also. How To Choose The Best Ski Jacket? The term “winter jacket” is very general because there isn’t one winter jacket. There are several types of such jackets and the definition of being insulating is the main quality of all winter jackets across the board. Now, when it comes to which types there are, we should look at it by category rather than particular design, since understanding how a particular style works is much more useful than just its name. Mainly, as with most generalized jacket labels, there are two categories, those who are made for casual wear and those focused on performance, also known as technical jackets. Casual winter jackets are designed for daily wear during winter and they are primarily made to be really warm. The reason for that is to make up for lack of movement, as opposed to a technical jacket that heats up as you exercise or move around, a casual winter jacket is quite insulating in itself and will keep you warm even if you barely move an inch. For this reason, jackets that are made for casual wear tend to be heavier depending on the design, but that’s not necessarily the case with all jackets. For example, those with high fill down insulation are much lighter than wool or fleece-insulated ones. Another important design consideration is comfort, since these are jackets that will be worn for extended periods of time. Lastly, style and practicality are also taken into consideration, since a casual jacket will be worn with different outfits and the cut, length and colors are much more varying. A technical jacket, regardless of what weather it is suitable for, is made for performance. The cut is usually much more snug-fitting and they also tend to be shorter than heavier casual winter jackets. The reason for this is to maximize performance, meaning that it won’t hinder movement or get in the way while you are out in nature. While the styles can vary and a technical jacket can also be worn as a regular, casual one, technical winter jackets come with certain features that are made for practicality. For example hoods that are compatible with helmets, zippers that can be used with harnesses and interior pockets for bottles or goggles. The materials are also much more durable since these jackets will go through challenging conditions. Before we move on to the detailed differences and comparison between the ski and winter jacket, it’s necessary to mention the most distinct quality of a winter jacket, the insulation. Insulation refers to a material’s, be it fabric or filling, to trap body heat, thus maintaining a constant and comfortable temperature against the cold. Down is a natural insulation sourced from waterfowl and it is the best insulator of all as it manages to trap body heat efficiently. It also compresses easily and is generally light weight. Synthetic insulation is made of polyester fibers that are either rolled into strands or made into cluster and balls, such as ThermoBall or PrimaLoft. While it does fall behind when compared to down, it does, however, perform better in wet conditions because it does not lose its loft when wet, unlike down. We should mention here that there are also mixed or hybrid insulations available, which are a mix of down and synthetic insulation, bringing together the best qualities of both. Lastly, fleece is also made out of polyester and it is created to perform like wool. While it works great for light insulation, it is not the best suited for heavy winter. However, it is long-lasting and layering will make up for its lesser insulating ability. With all that we know so far about the general qualities of the two, let’s take a quick look at the differences, to summarize all the information above. Ski jackets are snug-fitting, meant to be aerodynamic and provide great freedom while moving, which is very important when skiing. They are hip-length jackets that typically come with an attached hood that can be stowed away under the collar. The style and colors are not that many as these are performance jackets. On the other hand, winter jackets vary quite a bit in length. There are short and long designs available, from bombers to parkas, that you can choose from. They are bulkier than a ski jacket and the hood may or may not be present and is usually removable. Some designs also feature fur trims on the hood that helps protect the face and also adds to the look of the jacket. Both of them are insulating, but a ski jacket is much lighter and meant for layering rather than providing high insulation on its own. The reason for this is also the fact that this is a sports jacket in which you will be moving quite a bit and naturally heating up, thus more insulation would be counterproductive and uncomfortable. In regards to breathability, this is a very breathable type of jacket, which can also be accompanied by pit vents that allow for quick cooling. 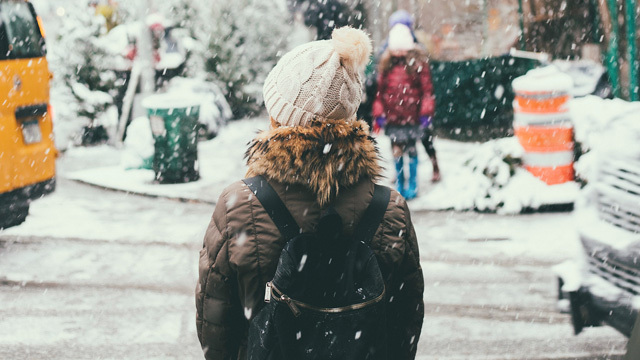 Winter jackets are really insulated and for this reason they also tend to be heavier. These are warm jackets that come in varying levels of breathability, but generally they are not the best at that, which is why they are not advised for sports, unless it’s a technical design. In this regard they vary quite a bit as there are winter jackets that are fully weatherproof, while there are also those that are weather-resistant at best. Overall, those insulated with synthetic insulation, and rarely those insulated with down, provide adequate weather protection. The fabrics used vary as more expensive options are made of higher quality fabrics, and winter jackets are typically made out of polyester and nylon for their shells and lining. As for ski jackets, considering that there is contact with snow, the jackets are made to be highly weather resistant and some are fully waterproof, such as those made of Gore-Tex, eVent, H2No or other fabric technologies. These are not only high-performance fabrics but also very durable, allowing you to make use of your jacket for many seasons. When it comes to price, there is also room for options. High quality ski jackets can cost quite a bit, but there are also more affordable options available. Winter jackets, too, vary greatly in price. There are cheap and extremely expensive options available, such as those made of Down insulation by brands like Canada Goose. Winter jackets and ski jackets are general terms used to describe a multitude of different cuts, designs and performance levels of jackets. They are similar in that they both provide insulation, but this is also where their main difference comes from. Winter jackets are warmer, whereas ski jackets are more breathable and lighter. They are both jackets for winter wear, but one is suitable for sports and the other is suitable for keeping you warm and cozy in harsh conditions.